Azaleas are an early flowering small shrub. The colors are vibrant pinks, oranges, reds, purples, white. Azaleas are able to handle full sun to shade. You will need to protect them from deer. I recommend you plant them near your front entry door where deer are less likely to congregate (most of the time.) You can also place netting on the shrubs during the winter months for protection. 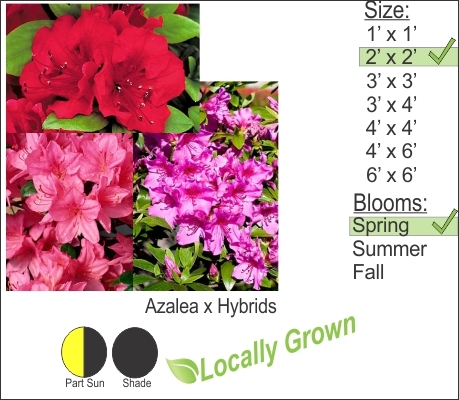 Watch out when purchasing azaleas from the big box stores. These unscrupulous chains will ship in flushed out azaleas (as well as other plant varieties) from South Carolina, Georgia and Florida. A lot of the Southern varieties are not hardy and will not survive the northern winters. You will be stuck with dead plants next year. I recommend you visit your local small garden center to purchase these plants. They will have knowledgeable professionals to help you and most small business garden centers will not sell you a plant variety that is not zone rated correctly for your region.